The first two states with 2018 primaries are Texas — March 6 — and Illinois — March 20. The thing about the Texas primaries is that in most cases they’re going lead to May 22 primary runoffs. So we’re going to be waiting for another couple of months before we know who the candidates we’ll have going up against Republicans for the blue-trending seats in Houston, Austin, San Antonio and Dallas, all of which are likely to deny any candidates 50% on March 6. 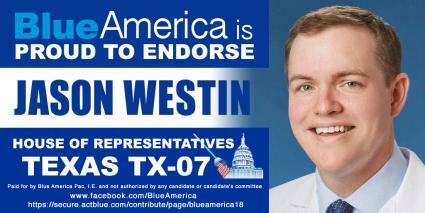 It’s a wide open race in west Houston, where award-winning cancer researcher and doctor, Jason Westin, has a bunch of establishment candidates he’s competing with, as well as another progressive. He can use some help. Same in Dallas, where our candidate, Obama’s deputy undersecretary of rural development for the Department of Agriculture, Lillian Salerno is facing off against two pretty garden variety establishment big money careerists. 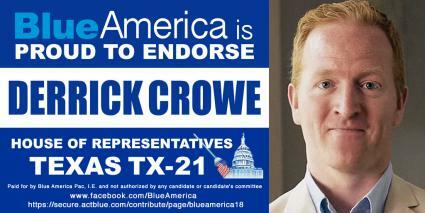 One of the Austin candidates, Derrick Crowe, one of the best candidates anywhere in America, is likely to be forced into a runoff with a multimillionaire Republican, Joseph Kopser, pretending — although not well — to be a Democrat. My first experience with Derrick goes back to when George W. Bush was still president and he was the organizing force behind Brave New Film’s “Rethink Afghanistan” project. He has a visceral understanding of progressive issues and appears to be someone who will be more than just a “good vote” in Congress, but someone — like Pramila Jayapal, Ted Lieu and Ro Khanna can come forward as a natural thought leader. He’s certainly running his campaign that way. The Illinois primaries later in the month have a more crucial sense of permanence. The candidate with the most votes will face off against the Republican. The race that’s gotten the most attention is in IL-03, the Chicagoland district that starts in the southwest part of the city around Bridgeport and the Stockyards, snakes down through Marquette Manor to Midway, through Palos Hills and to Orland Park, Homer Glen and Lockport just north of Joliet. It’s one of those rare races where an excruciatingly bad entrenched incumbent, Blue Dog Dan Lipinski, is being held accountable for the first time. 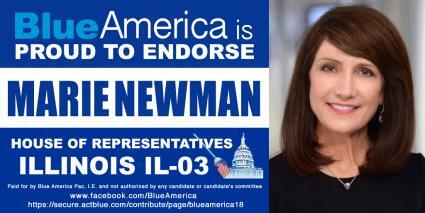 Progressives in the district, in the state and across America have backed Marie Newman, who would make a much-needed and excellent addition to the Illinois congressional delegation. The Republican in the race, Arthur Jones, an admitted anti-Semite is the former leader of the American Nazi Party. No, not every Republican is a Nazi… but it’s funny how they always find a home with the GOP isn’t it? Remember Boehner’s Nazi buddy in Ohio, Rich Iott? Anyway, whoever wins the March 20 primary — the Blue Dog Lipinski or progressive Marie Newman — will be sworn in next January because IL-03 isn’t about to elect a Nazi to Congress. The district didn’t even vote for Trump. He couldn’t even muster 40% against Hillary, who had been defeated in the district primary by Bernie. Polling shows an extremely tight race and it’s going to be Marie’s field operation that wins this one and sends the DCCC and the Democratic old guard a message that voters are watching what they do and holding them accountable. 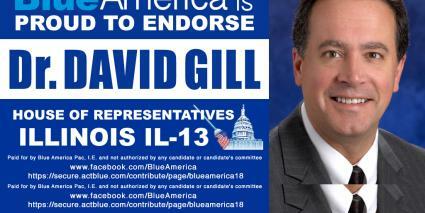 The only other candidate endorsed by Blue America in Illinois is Dr. David Gill in IL-13, a sprawling central Illinois district that meanders southwest from Champaign, Normal and Bloomington down through Decatur and Springfield to suburbs north and east of St. Louis. This was Bernie-country in 2016 and he beat Hillary in the district. And Gill is the candidate who has been working on Bernie issues for as long as Bernie has. Remember, the last time Gill faced off against Republican Rodney Davis, Davis won by just a handful of votes — 136,596 to 135,309, only because left-wing spoiler John Hartman, took 21,319 votes, throwing the election to a crackpot conservative. His message resonated last time — Help David get that message out to the few voters that got missed. He has three big-money establishment primary opponents who will probably split the establishment vote and allow Gill to face off against Davis in November. He definitely needs financial help for his field operation that will be in full swing in the next couple of weeks. This week, we’re asking you to consider helping our Texas and Illinois candidates and leave the others for another time — just this week. 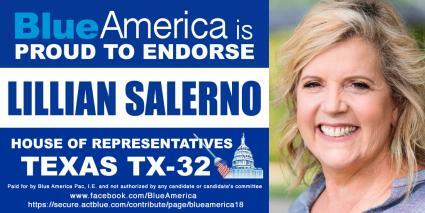 Let’s make sure the progressives get into the Texas runoffs and into the Illinois general election.